Airplanes and Rockets visitor Robert F. wrote to ask for a scan of the article for the Martin Baker M.B.5 that appeared in the May 1971 edition of American Aircraft Modeler. The M.B.5 came online at the beginning of the jet era, and never had a chance to prove its worthiness. 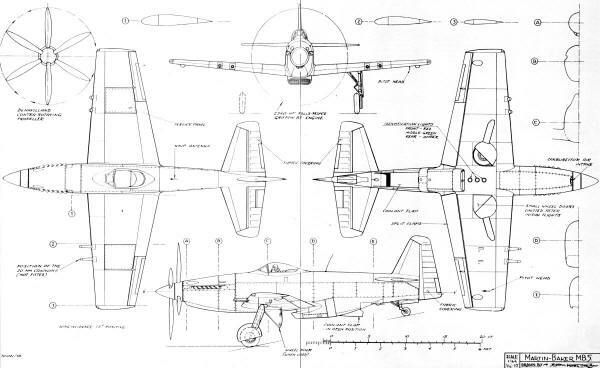 With a P-51 sleekness and contra-rotating props, it would have been a frightful opponent for the Luftwaffe. It included a brief historical perspective by Don Berliner, and the typical über high quality 4-view drawing by Björn Karlström. 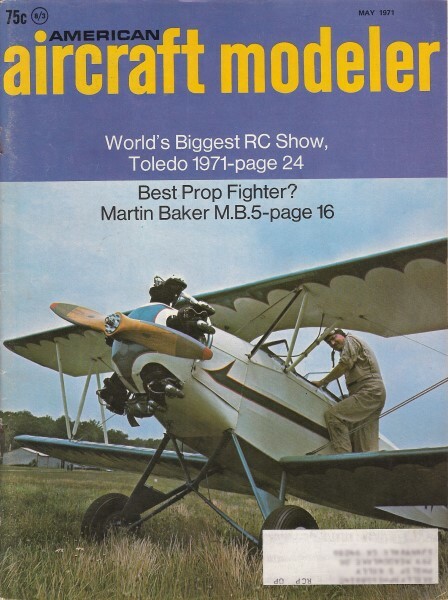 Martin Baker M.B.5 - Greatest Prop Fighter? Test-flown just two months before the Gloster Meteor jets went into R.A.F. service, the Martin-Baker M.B.5 promised much, but Whittle's invention took away its glory. OF ALL THE GREAT technical advances in the history of aviation, probably none has had the impact of the jet engine. In just a few years, it doubled speeds and ceilings and quickly thereafter doubled the airplane's load and range. In most of aviation, propellers are a thing of the past. The jet engine was, without a doubt, a genuine revolution. But is there a wind that blows all good? When the hot blast of the turbojet swept the skies of piston engines at the close of World War II, it left in its wake some airplanes that might have become great, had the times been a little different. There was the Republic P-72, a 490-mph development of the P-47 Thunderbolt. And the Supermarine Spiteful, which was a super-Spitfire capable of 494 mph at altitude. And the Focke-WulfTa-152, a super Fw-190 good for over 460 mph. And then there was the Martin-Baker M.B.5. Like the others, it was poised at the end of the runway, waiting for clearance, when the strange-looking thing without a propeller swooshed by. All the important people, who could have played an important part in putting the M.B.5 into production and showing the world the finest piston-engined fighter of all, suddenly lost interest. Here was a new standard of sleekness and glamour but, too bad, because the old must make way for the new. Wing Area - 263 sq. ft. Empty Weight - 9233 lb. Maximum Weight - 12090 lb. Maximum Range - 1100 mi. 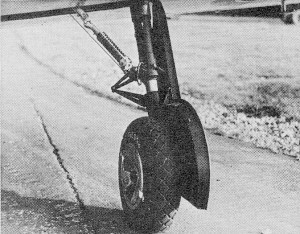 So simple and advanced was the landing gear design that serious consideration was given to incorporating it into all craft requiring retractable gear. Ease of service in general, plus many ingenious design innovations put this fighter ahead of , any then in service. 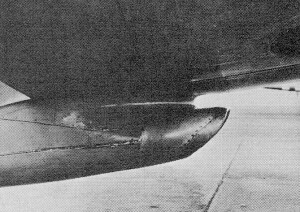 Junction of the air intake/fuselage was neatly streamlined. 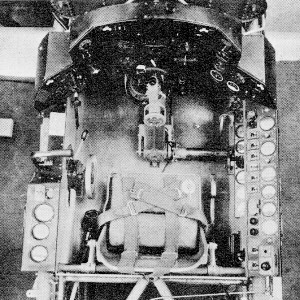 The cockpit and instrumentation also were of an advanced order. While well-equipped, it gave a feeling of simplicity-which would have increased a pilot's composure. But what of this Martin-Baker thing? For that matter, what of any Martin-Baker airplanes? Their ejection seats are world famous, having saved the lives of an estimated 2800 pilots. But this small British firm, which, in 1929, started out to build airplanes, turned out a grand total of four in more than 40 years in business. The first was a two-seat, low-wing, fixed-gear lightplane built in 1935 and lost in a shop fire after a brief but promising life. Next came the M.B.2, a prototype fighter unveiled in May, 1939, as World War II approached and new designs were desperately needed. Despite its fixed landing gear, it was faster than the Hawker Hurricane and almost as fast as the Spitfire. And it was designed to be built rapidly by semiskilled workers at relatively low cost, which should have made it very appealing to a country that needed a lot of airplanes in a hurry. But while the Hurricane and Spitfire went into mass production and history, 'the M.B.2 went to the scrap heap. The flamboyant Jimmy Martin and his partner and chief pilot, Capt. V. H. Baker, plowed ahead. Their next brainchild was the M.B.3 and it was a beauty. With a 2000-hp, 24-cylinder Napier Sabre engine and no fewer than six 20-mm cannon in the wings, it rust flew on Aug. 31,1942, and seemed headed for production. It was good for 415 mph at 20,000 feet and had outstanding' maneuverability and ease of control. Unfortunately, less than two weeks after its first flight, a dead-stick landing went awry and the .resulting crash killed Capt. Baker and demolished the M.B.3. In peacetime, such a blow to a small company and its prospects might have been too much. But the war was going full-bore, and there was little time for mourning. The M.B.3 was obviously a good airplane, and so Jimmy Martin went back to work, changing the engine to a 2200-hp Rolls Royce Griffon V-12 and calling it the M.B.4. The idea looked good, but it was dropped before a prototype was built, and the M.B.S took its place. This one was basically similar to the M.B.3 but cleaned-up and modernized and powered by a 2340-hp Rolls Royce Griffon 83 driving a six-bladed contra-rotating propeller. Armament was down to just four 20-mm cannon, but speed was 'way up; The prototype )Vas test-hopped on May 23, 1944, and quickly became known as an outstanding airplane. Unfortunately, at least for Martin-Baker, the rust Gloster Meteor jets were delivered to an RAF squadron less than two months later. Thus, despite the M.B.S's excellent qualifications, the game had changed and it was forced to sit 011 the bench while the awkward, but awfully fast, jets ran with the ball. 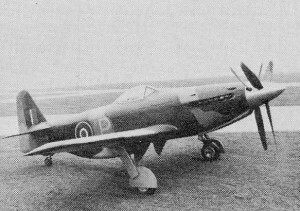 Had the M.B.S come along earlier, or had the jets come along later, aviation history might have been full of praise for the' Mustang-like speedster from Denham, near London. It had everything but timeliness. The result was something like oblivion. "From a maintenance and operation standpoint ... the (M.B.3) presents ease of inspection, replacement of components and repair in the field due to failure or enemy action unparalleled in any fighter type aircraft (existing) today (April, 1942). With few exceptions, the aforesaid maintenance items could be performed by extremely unskilled men, with a (minimum) of special tools.. . It is (my) belief. .. that from this consideration alone, the project presents such, worthwhile elements, that the dissemination of the information concerning these factors to designers ... both in the United Kingdom and America, would be of untold benefit to the joint war effort." The report concluded, "It is Mr. Wolff's opinion that. ... the many design innovations (such as armament, powerplant, etc.) warrant immediate attention and analysis ... for ultimate incorporation in all service aircraft." He elaborated, "The landing gear presents a most unusual and practical design; its extreme simplicity of location, fabrication and assembly, coupled with its ingenious mechanical characteristics, render it a very valuable development, and should be studied with a view to incorporation into all aircraft utilizing retractable gear." " ... by far the simplest powerplant installation which I have ever seen." "The armament installation presents an ease of production and assembly which is unparalleled in (my) experience." Since airplanes have to be built and then repaired, these qualities are certainly important; moreover,' the lack of them has doomed many an otherwise great airplane. But ease of maintenance doesn't mean much if the airplane is a dog. Only one M.B.S was built, and so not many people got a chance to fly it, but it appears that no one who ever flew it will forget the experience. To R. G. Worcester, who tested it long after it became obsolete, it bore similarities to the Spitfire" which is the ultimate in praise from a British pilot.
" ... the instruments are placed rather low and ... are all easily readable. Taxiing is easy... Initial acceleration is tremendous, ... and there is no tendency to swing ... (the crosswind) had no effect whatever. Lateral stability is good. Even with the contra-prop in fine pitch, the vibration is much less than usual for a fighter. Forward view is so good that the impression of an unusually steep nose-down attitude is formed on the approach for a normal landing. Taken all 'round, this is a highly maneuverable aircraft, the controls respond finely, like those of the Spitfire... The atmosphere in this aircraft was thoroughly 'likeable' and there was a feeling of security in the knowledge that it has an enormously strong structure." The highlight of its otherwise unsatisfying career probably came during the 1946 Farnborough Air Show, when the late Polish aerobatic ace, Jan Zurakowski, put it through a routine they still talk about. Not long after, the trail, grew cold. The M.B.S was used briefly as a test-bed for the contra-rotating prop, but nothing more is known. Yet, it ,could hardly have disappeared without a trace, as it seems to have done. As a ma tter of fact, a recent letter from a spokesman for Sir James Martin ends with this tantalizing remark: " ... but we understand that it was purchased by an American, and recently we were told that is was still flying somewhere in the U.S.A. But where?